It’s been a while since Brendan Fraser had a showcase like this, the second episode of a TV series where he probably isn’t going to be the main character. Fraser has received more press/internet attention for a meme of his enthusiastic Golden Globes clapping and melancholy profile (including sexual assault allegations about the former president of the Globes) promoting this very series than any of his film work in recent years. But “Lone Star” might still have served as a reminder of his skill as an actor even if his career hadn’t taken something of a downturn over the course of this decade. That’s not a slag on Fraser’s film work so much as a recognition of how easy it is for an actor to get pigeonholed. In Fraser’s case, as detailed in that excellent GQ piece, he was pigeonholed as the grounding, mayhem-friendly anchor of a bunch of movies that tended to land somewhere on the slapstick-to-adventure spectrum. That is to say, if the third Mummy movie had matched the grosses of its predecessors and Furry Vengeance had been a hit with the kids, Fraser probably would have stayed in higher-profile projects since 2010 or so, but more than likely it would have been, you know, a fourth Mummy, and something else where he fights and/or befriends cartoon animals. Even in his prime, Fraser was not turning up in a lot of “serious” or ambitious movies, in part because plenty of people probably don’t consider how good he is in a movie like Blast From The Past or Looney Tunes: Back In Action, because he does the old movie star job of making it all look a lot easier than it probably is. That’s also what Fraser does in “Lone Star”: He takes a character who acts more or less like you’d expect based on his appearance (big, slightly goofy, affable; your basic Brendan Fraser type plus a cowboy-hat-sized splash of Texas) and makes his charm look natural, easy, and appealing. After just a few seconds of screentime in the first episode of Trust, he rolls into the second episode talking to the camera—or rather, talking to the cameras, plural. As Fraser’s Fletcher Chace strolls out of his flat, swigs from a glass bottle of milk, waxes philosophical about the historical noteworthiness (or lack thereof) in 1973, climbs into a car, and heads to the Getty estate, episode director Danny Boyle makes a point of cutting to other vantage points from within that car, and having Fraser turn to face those different angles, too. It would be easy to dismiss this as restless cutting, Boyle not wanting to stick with a single shot choice where Fraser faces the camera head-on. But not having Fraser simply holding a frame as he speaks draws even more attention to the artificiality of this device; when the camera cuts to a different angle and Fraser/Fletcher turns to speak into it, he’s exerting a kind of control over how talking-to-the-camera shots usually go (especially now that smartphones have made talking to the camera more ubiquitous than ever in “real” life). “Lone Star” doesn’t keep strictly to Fletcher’s point of view (even in a sprawling ten-episode ensemble-cast series, it seems that would be too big of an ask in today’s serial-TV environment); he’s not even in the first group of characters we see in “Lone Star” (that would be the younger Getty’s girlfriend and her twin sister, threatened in their squat over Getty’s failure to deliver some promised money). But by letting this character, and so far only this character, talk to the camera, even when it tries to cut away, Boyle is letting Fraser take over for a bit. Plotwise, Fletcher’s role in this episode is as straightforward as Fraser’s charm. Once word gets out about the Getty kidnapping, Donald Sutherland’s self-interested Getty patriarch, mostly concerned about the sheer number of unsecured family members he has floating around out there, just waiting to be ransomed, sends his own investigator to Rome (with a metal briefcase full of cash, no less) to track down his missing grandson. There are other threads to this episode, namely the introduction of young Paul’s mother Gail (Hilary Swank), who has divorced out of the Getty dynasty but is more eager to go to Getty for help than her floundering ex-husband. 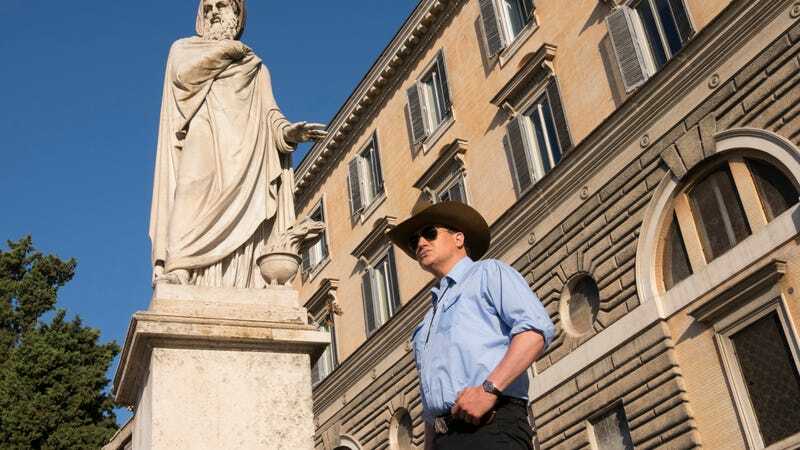 But much of “Lone Star” consists of Fletcher Chace poking around Rome, talking to family members, associates, service people, and possible mafia connections, seemingly confident about his ability to find this kid. Though the arc of a ten-episode series places limits on our expectations of what Fletcher is going to uncover in an hour, watching this split between a procedural and a character study is still more compelling than anything in the further-ranging first episode. Back when Boyle burst onto the British film scene with Shallow Grave and Trainspotting, it was easy to see how critics could draw comparisons to Quentin Tarantino, what with his movies’ violence, profanity, dark humor, and poppy energy. “Lone Star” reminded me of Tarantino, too—but not in its violence (which, despite a very Boyle-ish crazy shoot-up sequence at the opening, is not especially strong), nor even its era-mixing stylistic touches (split-screens and canted angles that seem imported from neither Rome in 1973 nor Britain or the U.S. in 2018). Rather, it’s Boyle’s fascination with this singular oddball, cheerfully out of his element but confident nonetheless, that recalls Tarantino’s interest in loquacious cowboys, both contemporary (Earl McGraw, a recurring Michael Parks character from several of his projects) and not (his recent foray into actual westerns). He doesn’t exactly celebrate Ugly Americans, but Boyle seems more interested in Fletcher Chace as a character than as a detective, even though he does a decent enough job tracking down some answers in Italy. Speaking of which: After attempting to track the young Getty through Rome, and examining the copious diaries and sketchbooks he kept in that usual kid-in-a-movie-filling-every-corner-of-the-page fashion, Chace concludes that the kidnapping was most likely a fake. Though it seems like Trust is playing it a little ambiguous about whether this was a fake kidnapping gone real or not, the final scene of the episode makes it pretty clear that the Getty kid is in very real danger. It’s a narrative necessity, but also works as part of the episode’s character study angle. Fletcher is perceptive, charming, tough, and comes to the wrong conclusion. I imagine he’ll figure into other episodes, too, but his car ride back to his flat also manages to feel conclusive in a way that lamentably few serialized TV episodes are able to pull off. I love that multiple tips from one of those living statues. That seems very Boyle to me and I’m not sure why. He seems amusingly suspicious of tourism, I guess; recall the ruinous arrival of Leonardo DiCaprio to the secret island paradise in The Beach, or the havoc caused by the junkies of Trainspotting during the Edinburgh Festival.